Recently I've been absolutely in love with the movies of John Carpenter. 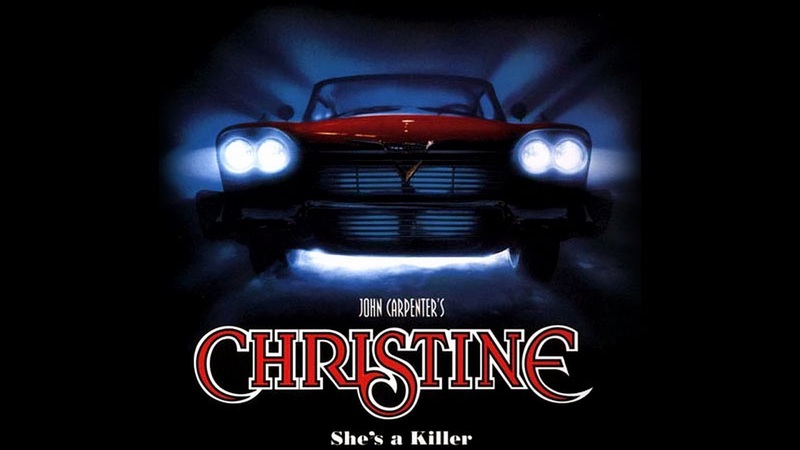 A bit of an interesting entry in his early career is the horror/thriller Christine (1983), a movie I didn't realize is adapted from a Stephen King novel of the same name. Among other things I didn't realize the first time I watched this film was that it contains a critique of its subject matter. I thought it was your typical male fear-fantasy of feminine jouissance simply brought into the realm of automobile fetishization. After a quick chat with my good friend Garth and another trip through the movie I've been convinced of exactly the opposite. 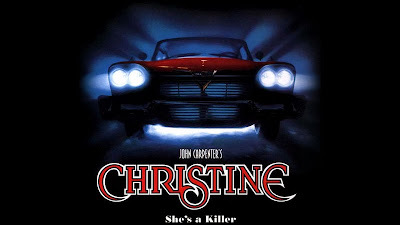 So today I'm here to tell you why fans of Stephen King or horror in general should probably go see John Carpenter's Christine. So this is a movie about an evil car named Christine. 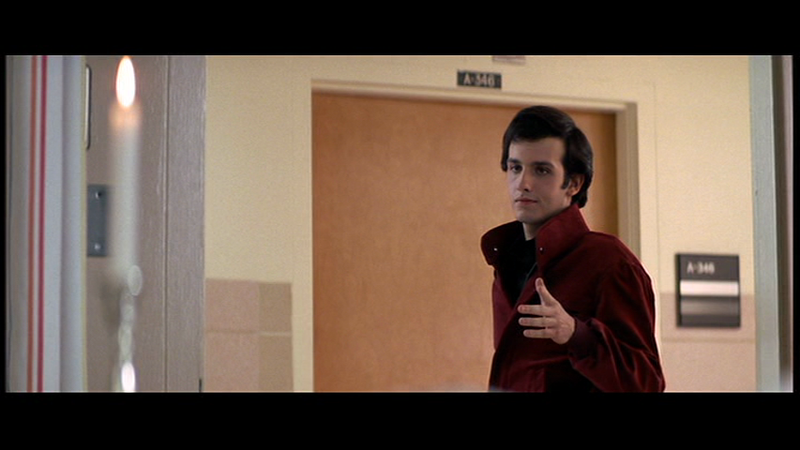 Arnie (Keith Gordon), is your average high school loser who can't seem to make friends beyond the amiable and infinitely sympathetic Dennis (John Stockwell). 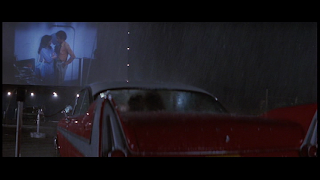 After the first day of a new year in high school with a similar lack of social success, Arnie sees Christine for sale and immediately falls in love. He buys the car and fixes her up himself, but Dennis begins to notice that as Arnie spends more time with Christine he's slowly turning into a caricature of The Fonz. He's gaining in popularity, but losing all his likable qualities. So when kids who used to bully him start dying in mysterious circumstances (all involving his car Christine) Dennis must wield all the mental fortitude he can muster not to jump to conclusions about who's to blame. Before getting into what this movie may or may not be trying to say, I'd just like to point out that it's a pretty great movie just in terms of quality. Keith Gordon and John Stockwell both do fantastic jobs as the contrasting male leads, and Robert Prosky is excellent in his supporting role as the owner of Darnell's (the repair shop where Arnie keeps Christine). 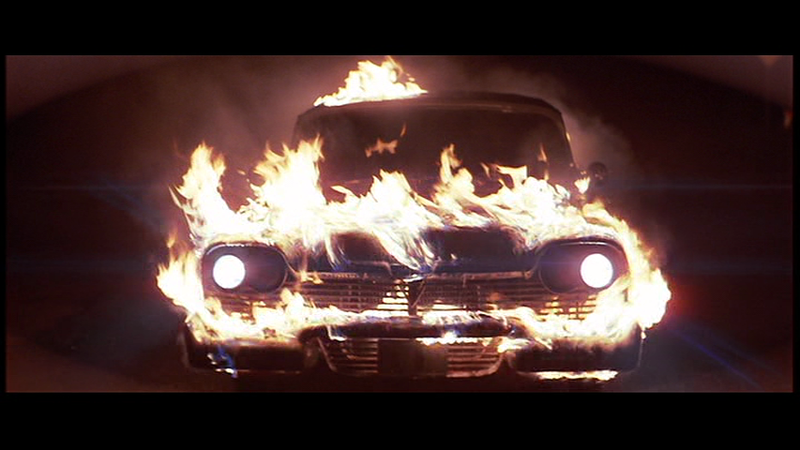 The practical special effects are also amazing (check out these stills of Christine on fire), and as usual John Carpenter straddles the line between b-movie and blockbuster. Even by today's standards there's very little here that looks cheesy or obviously fake. It's also not totally clear that this is even really a horror movie. Most of the common horror tropes are there, including The Monster Might Not Be Dead Ending, one of my personal favorites. But on the other hand, the body count in the film is pretty minimal and when there are deaths on screen they're pretty tame and bloodless. The filmmakers even said they had to add in lots of swearing to try to keep little kids from seeing it. So while I'd say it definitely plays out like a horror film, horror fans might find themselves disappointed by the amount of death and destruction in the movie. Look! They're watching a movie in the movie! So now that we have that out of the way let's talk about a problem I have with some horror films and how Christine turns this trend on its head. Many horror movies from classics like Carrie to Japanese imports like Ringu to cult b-movies like The Wasp Woman feature horrifying, feminized monsters. All too often this comes off as a way to demonize women stemming from a fear of female enjoyment. Women are these scary things with amorphous desires, so we make them into monsters on screen so we can more succesfully integrate them into out symbolic universe. Of course this isn't universally true. There are both horror films with male antagonists as well as movies with female antagonists that deviate from or even criticize this tendency (Teeth is an absolutely amazing example of this reversal). 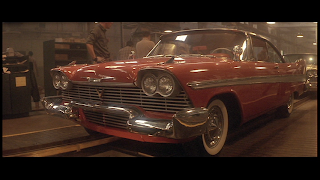 Christine fits into this latter category: while it certainly has an evil female antagonist (the car itself), its malignancy is more caught up with the objectification of the male gaze than anything else (yes I understand Christine is, in fact, an object, but that's not the point). In the opening scene we get a sequence of a factory line creating these beautiful, picture-perfect 50's Plymouths with a vast crew of men working to make sure she's spotless. Christine is thus brought into being under the objectifying male gaze. 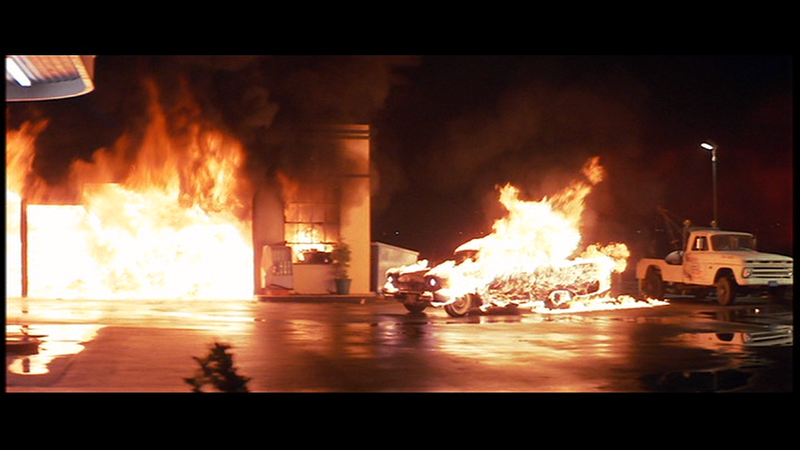 Everyone she kills fits into this theme, from the man at the beginning who ashes his cigar in the car, staining Christine's perfect image, to Buddy Repperton and his idiot gang of idiots who tear the car apart in the middle, to Dennis and Leigh who try to take Arnie away at the end. The satire and female empowerment definitely aren't as profound or penetrating as in something like Teeth, but there's definitely more to this thriller than meets the eye. - Check out my review of Teeth if you haven't read it before. That movie is fabulous. - In the final scenes of the movie, Alexandra Paul had her twin sister Caroline play her part (most noticeably when she's riding in the bulldozer). - For you adaptation nerds out there, there's at least one major difference between the book and the movie. In the book Christine is possessed by the ghost of her former owner and in the movie she seems to be created evil (whether or not this evil is the result of the male gaze). - Leigh (Alexandra Paul) went on to star in Baywatch and Detective Junkins (Harry Dean Stanton) made this after Alien and before The Green Mile. Oh and Dennis (John Stockwell) will go on to become Cougar in Top Gun. I saw this movie on DVD a long time ago and thought it was well-made. Definitely a B-movie, though, like most Stephen King horror adaptations. Something like 'Christine' really belongs in the eighties and the novel idea of a possessed car is a rare subject in movie these days, unless you consider possessed toy dolls in the same league. But it's probably a fact that Stephen King horror movies are generally crap and throwaway. His serious stuff works better, although the original 'Carrie' and the original 'The Shining' work. My personal fav SK books are 'Pet Sematary' and 'Hearts in Atlantis' and they were made into average films. 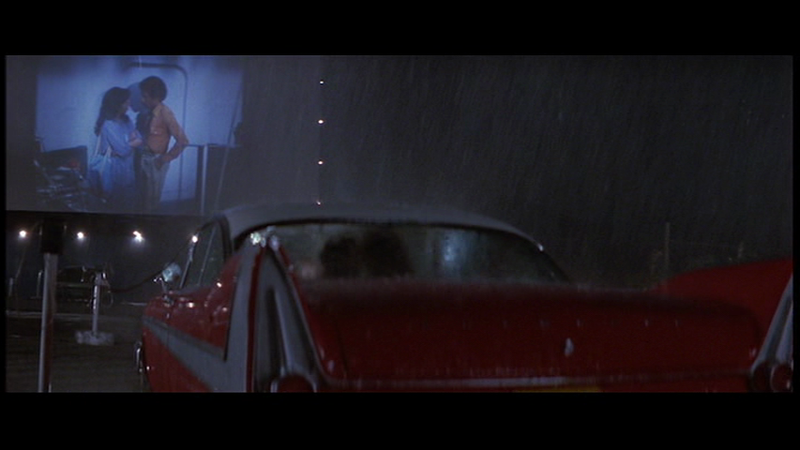 Yeah Christine is definitely an 80's movie to the core. I love the style they bring in from the 50's too with the increasingly large collars of Arnie's various jackets. I find that I tend to like Stephen King adaptations, although like you say most of the horror ends up in the b-movie category. I think my favorite books of his were The Shining and The Gunslinger, although I haven't read any of them in a while now.